I saw a beautiful succulent looking plant covered in prolific blooms. The flowers looked a bit like and old fashioned single rose. The woman told me it was like a succulent but wasn"t, needed to be in the perfect spot with good light but indirect sunlight. She said it strikes readily from cuttings but I was not in a position at the time to take advantage of her offer to get some cuttings. She has now shifted. I can"t find this plant anywhere. Has anyone heard of it and where could I get it please? Yes I know this plant well and is readily available here in Brisbane at most nurseries. 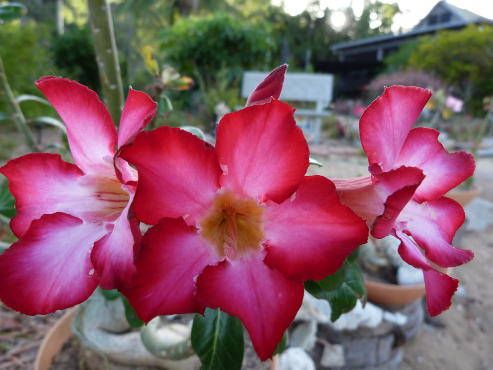 I don"t think that it grows well from cuttings because it doesn"t reach its potential. So a small plant would be better. Perhaps your local nursery can get it in for you. Thank you so much. I will ask my local nursery to obtain one for me. Janet I also meant to say that I agree with Jean , they are better from seed rather than cuttings, my seed pods just ripen and the seeds fly away in the air with little wings, I find them popping up everywhere. I agree sun sun and more sun as they are desert plants but grow in succulent mix not potting mix.or they could rot .I grow them in pots out in full sun through the wet season in Cape York.fertilise with a sprinkle of slow release every change of season and when the fill the pot repot to next size pot. 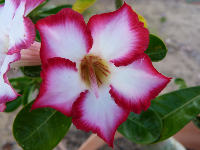 You can buy Adenium (Desert Rose) 10 small assorted colour plants for under $40 including postage from Plants in a Box. They are supplied in tubes and the plants themselves are around 20cm tall. Pot in a succulent mix and not overwater them or they will drop their leaves. They love sun and warmth. I live in Brisbane and they survive the winters here well.